What will the world be like at the end of the 21st century? UN statisticians warn we’re headed for a Malthusian nightmare in which too many humans compete for too few resources on a planet degraded beyond recognition. But in a provocative new book, Empty Planet: The Shock of Global Population Decline, out Feb. 4 from Penguin Random House, pollster Darrell Bricker and journalist John Ibbitson argue the opposite is true: that falling birthrates around the world portend a future in which Earth’s population is older, smaller and more urban — and in which Canada is uniquely positioned to weather social and economic challenges. Watch Darrell Bricker and John Ibbitson LIVE in Ottawa, Feb. 27, 2019 at 6:30 p.m.
JI: I thought population decline was happening because society was urbanizing. On a farm, children are an asset, another pair of hands to help out, but in a city, where space is at a premium and the cost of living is higher, children are a liability, so it makes sense that urbanization would lead to people having fewer kids. But the bigger reason for population decline is that as we urbanized, more women became educated and demanded and acquired control over their own lives and bodies. And when that happened, women decided to stop having so many kids. So global population decline has as much to do with the empowerment of women through education as it does about the economics of children. DB: It used to be that when women thought about having kids and how many kids to have, the decision was rooted in some kind of external agenda — it was for their husband, it was for their country, it was for their religion. When it’s for themselves, and it’s about self-actualization, we find that for the most part they’re happily self-actualized after two children. JI: It doesn’t matter whether you’re in a developed country or a developing country, whether you’re a man or woman. It doesn’t change much by economic class. We went to Brussels and talked to young professionals about why they weren’t having kids. We talked to students on the campus of Seoul National University about their plans for their future families. We talked to aid workers in a favela in Rio de Janeiro about why the women there are choosing to have fewer kids. We talked to women in a slum in south Delhi about why they didn’t want to have more than two kids. These were wildly disparate groups of individuals around the world who were all experiencing the same feeling, but for different reasons and manifesting it in different ways. 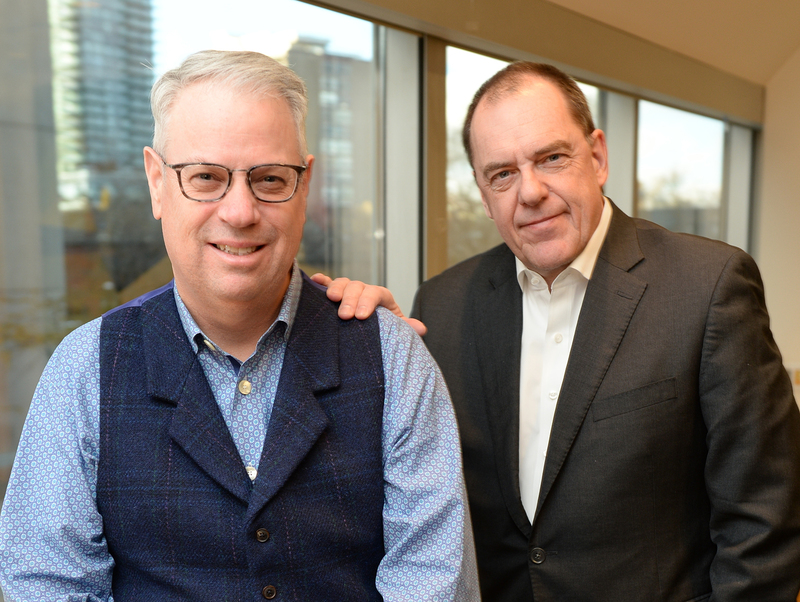 Darrell Bricker, left, and John Ibbitson are the authors of Empty Planet: The Shock of Global Population Decline. DB: It’s going to be a much older country. Right now, most of the world’s population growth is due to people living longer, not because they’re having tons of kids. Today, the average Canadian lives to 81; if you have a child next year, it’s likely that child will live to 100. JI: And Canada will be unique because it will continue to have a very robust immigration policy. When we started writing the book, I thought the thesis was going to be, “Everybody needs to accept immigration or their population will decline.” By the end, I think we had come to the rather rueful conclusion that for many countries, that’s just not possible — the pull of nationalism is so intense, it’s difficult to see these countries bringing in enough immigrants to sustain their populations without social tensions becoming intolerable. There’s a sadness in that, but it also means that future generations are going to live in a world in which Canada has a much larger share of the globe’s population than it does today. JI: Some of what you’re seeing with the Trump phenomenon in the United States is the sense of growing insecurity and even fear among white Americans over the arrival of non-white immigrants. Those immigrants are absolutely vital to the future of the United States because of fertility declines among the native-born population, but the social dislocation it causes is enormous. DB: What’s interesting about the present rate of immigration is that it’s a temporary situation. A lot of the places that are currently significant sources of immigrants in the world are going into their own population decline. We think that within 80 years, you’ll actually see countries competing for people because there just won’t be that many immigrating. JI: There are about two dozen countries, including Japan and Spain, whose populations are already declining, and it’s very hard for them to sustain their economies. They can take care of labour shortages through automation, and they can offset higher health-care costs in an aging society by cutting back on primary education and daycare because there are fewer kids. But even if these countries account for all of that, they’re not going to have enough consumers to keep their economies going. JI: Anyone who says we don’t know what we’re talking about will point to sub-Saharan Africa, where people are still having lots of children — and they may be right. But in almost every country in the region, urbanization is underway, education of women is increasing and fertility rates are in decline. So not only do we think we’re right, we think we have a good news story about growing affluence and autonomy for women in Africa. DB: We looked at how some countries, like Sweden, have tried to encourage people to have more kids, by supporting paternal leave, for instance, or striving for a better work-life balance. Some of these measures have had a marginal impact on fertility, but it usually doesn’t last and the impact tends to be relatively small. So apart from immigration, there really isn’t another solution — unless we grow people in pods. JI: Or unless society’s attitudes change. What happens if people just grow lonely? What if they feel they missed out on something growing up in a household where they were the only child, or they resent how empty the streets were when they were kids? Then there will be a massive societal shift in favour of having larger families just because the world is lonely and empty — but that won’t happen in this century. In Empty Planet, authors Darrell Bricker and John Ibbitson draw on a wealth of research and firsthand reporting to illustrate the real and dramatic consequences of global depopulation including worker shortages, a weakened economy and crippling demands on healthcare and social security. Rigorously researched and deeply compelling, Empty Planet offers a vision of a future that we can no longer prevent — but one that we can shape, if we choose. Join The Royal Canadian Geographical Society for our next Can Geo Talks events in Toronto and Ottawa. Wednesday, February 27, 6:30-8:30 p.m.